These were all made in the Midlands, but to regional patterns. The differences in shape and weight seem subtle (and possibly irrelevant!) 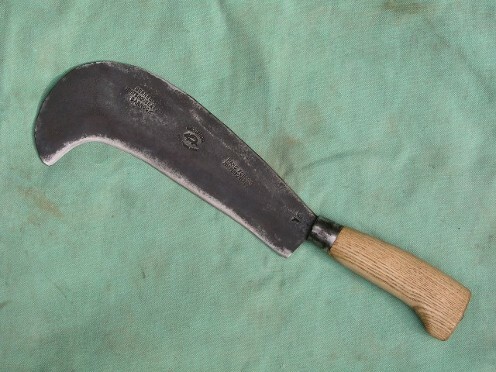 to the uninitiated, but try giving an unfamiliar billhook to a coppice worker and you'll be left in no doubt as to its drawbacks. If you want to purchase tools like the ones below please contact me. 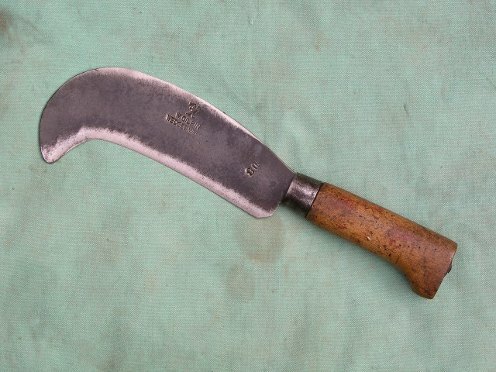 Elwell 3901: Tenterden pattern billhook, 10 inch. 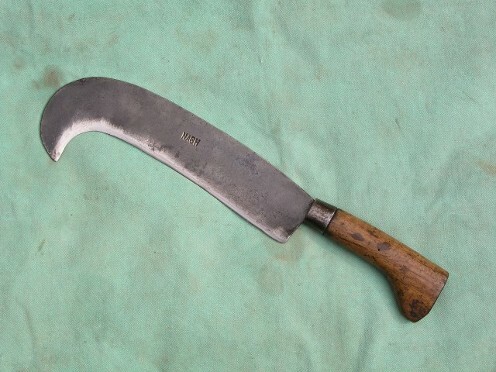 This is perhaps the favourite tool for the coppice trades in the South East. It is alleged to have been copied by Elwell from handbills made by Thomas Beal of Tenterden in Kent. Most examples are beautifully balanced: the blade's thickness tapers, and the tang is quite thick, placing weight in the users hand, making it light to use but giving a good cut without excess effort. 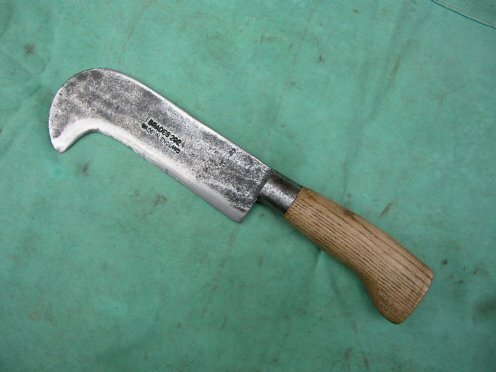 Elwell 3583: Sussex pattern billhook, 10 inch. 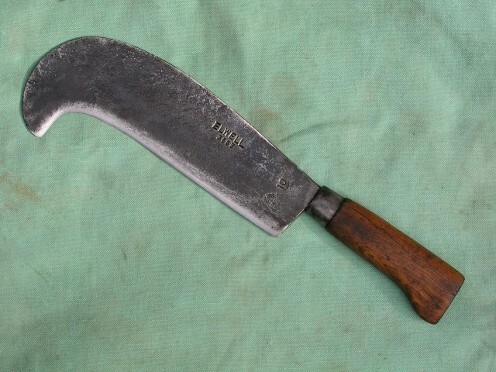 Quite a few manufacturers made a Sussex pattern billhook. Elwell's version is perhaps not the best. It is a bit blade-heavy for my taste, but undeniably will cut powerfully. 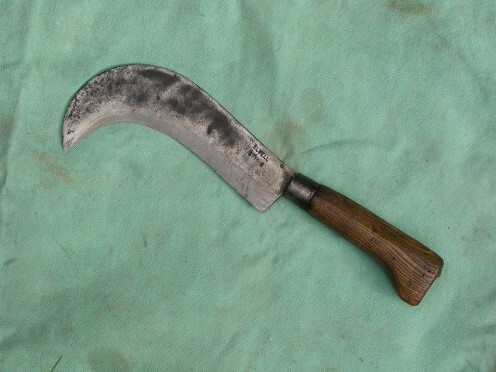 Elwell 4489: Lewes pattern billhook? 10 inch. A beautiful object, superbly forged, and uncommon. Light, and cuts like a dream. I can't find it in any Elwell catalogues, but I've been told it is a Lewes pattern, and this seems plausible. 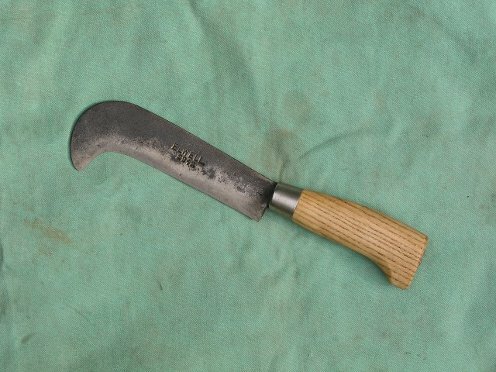 Elwell 3711: Hampshire (Moss) billhook, 8 inch. Older Elwell literature calls this a Hampshire Moss, I assume that they were inspired by the tools of the Moss Family, from the area where Sussex, Surrey and Hampshire meet. It seems better balanced than most of the Moss billhooks that I've handled. 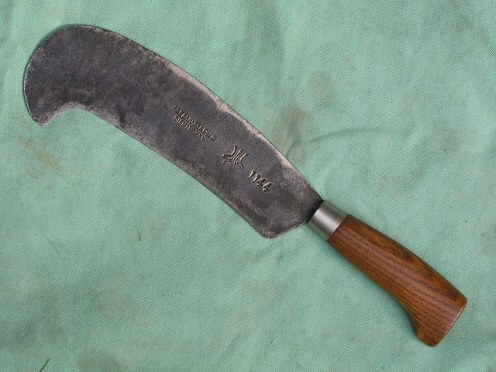 This pattern is sometimes favoured by hurdle makers for trimming rather than cleaving. Elwell 3902: (Dorset) Spar Hook, 7 inch. A good little hook, and the tool often preferred by spar makers in the SE. Elwell 2942: Spar Hook (Small Pruning Hook) 7 inch. This pattern is listed as a pruning hook in older catalogues. Light and slim. Cornelius Whitehouse ('Hedgehog') 1102: Tenterden pattern, 10 inch. I'm pretty certain that this is a 1102, but the shape is very close to a 1104 Lewes pattern, and the number isn't marked on the tool. I'm sure that when new it would have been easier to tell, but a bit of sharpening can change things! Not a bad hook, but the blade thickness doesn't taper much towards the tip, and the tang is slim, so the hook feels nose heavy. 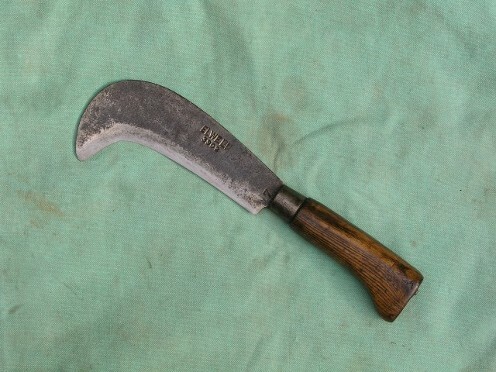 Cornelius Whitehouse ('Hedgehog') Spar Hook, 8 inch: Beautifully slim and light hook of the a South East shape - no number to relate to catalogue. 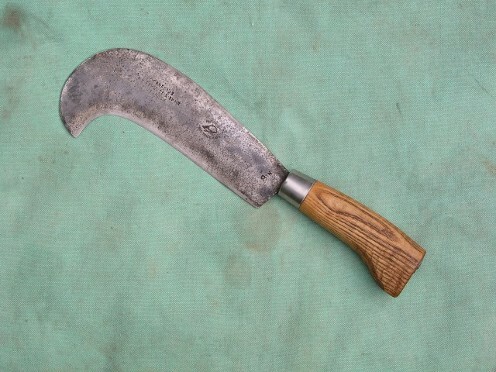 Parkes ('Biped') 1144: Sussex pattern billhook: For me this is one of the better Sussex type billhooks, and despite a deep blade it is very well balanced in use. This works well for some hedge layers - the short nose (hook on the end) helps when working in the bottom of a hedge. Gilpin Spar Hook, 8 inch. A well balanced and nicely finished hook. Nash Sussex? 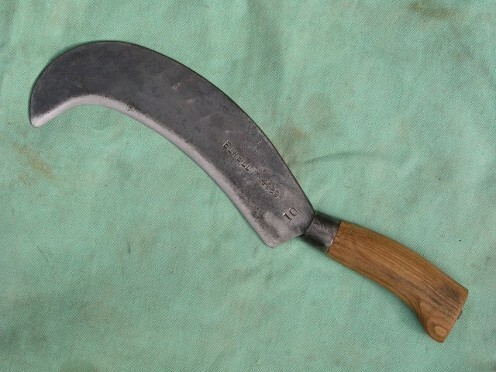 A good billhook, not too heavy. This seems to be a Sussex pattern to me, but the catalogue I've seen (early C20) has a Tenterden listed that seems the best match. Perhaps it is earlier, or has been sharpened out of shape? 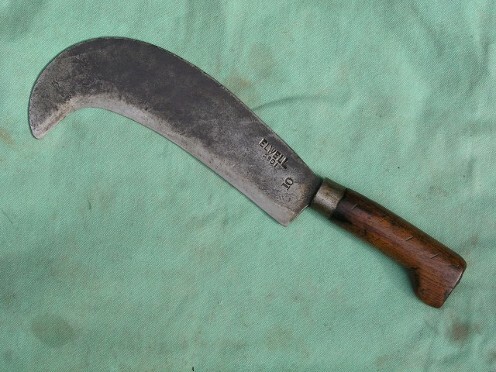 Brades 292: A Spit Hook, according to the mid C20 Brades catalogue. A bit like the Elwell Small Pruning Hook, but heavier and less well balanced. See also: photos of handbills made by edge tool makers in the Weald.